Finding new and better ways to solve your gravity flow storage challenges is our mission, every day. And our latest pallet flow racking accessory is a perfect example. The new Bolt On Pallet Flow Ramp Stop delivers a far better way to combat pallet flow lane damage, safety issues, repair and replacement costs. 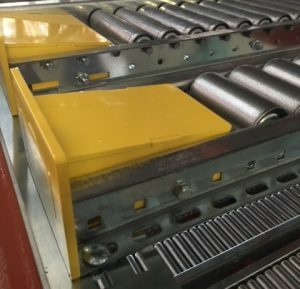 The pallet flow ramp stop is an accessory that prevents heavy pallets from pitching forward out of the flow lane as it arrives at the pick face. The ramp stop is now bolted onto the pallet flow rack lane as opposed to welded which enables warehousing staff to quickly replace forklift damaged stops and/or accomplish faster, cheaper lane re configurations. The hardware used to bolt the new stops is heavy duty like the ramp itself and provides the security of a welded attachment but the flexibility of a bolted piece… best of both worlds. 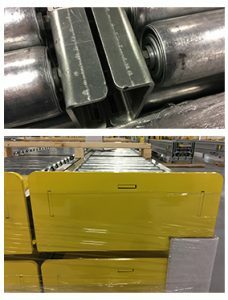 The safety yellow, powder coated finish solves many of the unique challenges for food warehousing and packaged grocery facilities in particular. As opposed to galvanizing, the powder coat will not wear off and rust after repeated wash downs and there is no risk of toxic gases from welding galvanized materials when you are using bolts to secure the ramp stop. In addition, the bolt on attachment can even be removed, sandblasted and repainted if desired. The bolt on pallet flow ramp stop has many benefits particularly dealing with lane safety, accessibility and maintaining your warehousing operations bottom line. Give us a call to discuss these and any other warehousing challenges you may have. We are eager to talk with you and develop solutions to keep these wheels of change flowing.